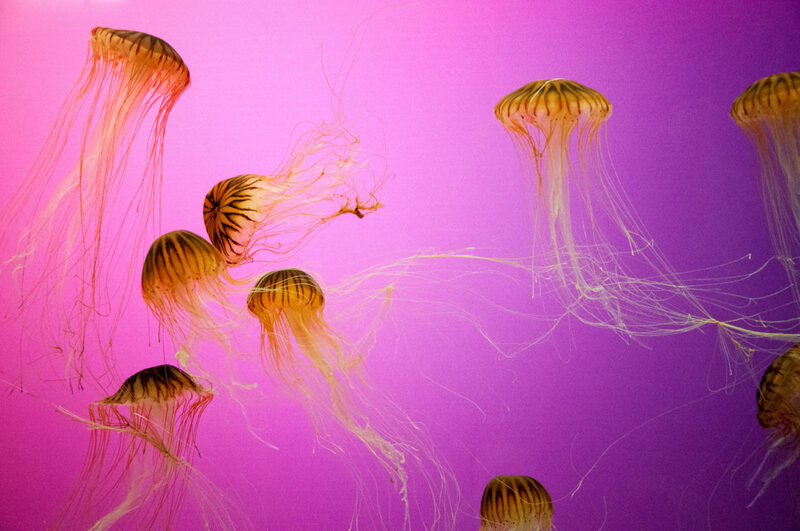 Jellyfish float in a display at Chicago's Shedd Aquarium in April 2013. Microgrids have struggled to compete with cheap power in the region, but a fledgling movement is finding a foothold. The Shedd Aquarium in Chicago’s glitzy downtown loop is home to thousands of creatures, from shrimp to beluga whales, each dependent on a habitat that precisely mimics their natural environment. It takes a constant power source to keep the lighting and temperatures just so for the more than 100 environments, and for that, the aquarium counts on a microgrid. “The diversity of life and the environment requires a pretty reliable, resilient power system to ensure the safety,” said Drew Gravitt, a sales manager with Schneider Electric, an energy management and automation system company that manages the aquarium’s power system. The aquarium’s power system, which can operate as an energy island in the event of a grid power outage, is an example of a fledgling movement in the Midwest to invest in microgrids as a form of insurance for reliability and resiliency. Microgrids have not found fast traction in the region, mostly because the cost of power is low and distributed resources have not been developed as aggressively here. But that is changing as schools, large companies, and other institutions invest in behind-the-meter microgrids, especially here in Illinois. “Illinois is the bright spot in the Midwest,” said Peter Asmus, a principal research analyst with Navigant Research. Navigant Research tracks the growth of microgrids internationally and publishes a microgrid tracker every two quarters. The region had 58 microgrids as of Q2, 2018. The top segments were commercial or industrial (18 projects), campus microgrids (15 projects), and military installations (11 projects,). Illinois had the most microgrids with 15, followed by Michigan (10) and Minnesota (9). “In terms of capacity, Illinois, Michigan, and Minnesota are the only three Midwestern states that are in the top 25 of U.S. states,” said Johnathon de Villier, a Navigant research analyst. The number one barrier facing microgrids — especially utility-scale microgrids — in the region is the low cost of power. As a result, Chiesa said S&C is regularly pushed out of the microgrid sales in the Midwest. S&C Electric only works with large-scale commercial and industrial users, and S&C doesn’t make low-voltage devices. But Chiesa and Asmus agree that things are changing with the growth of distributed resources and utilities looking at non-wired alternatives. “That’s where the worm will turn,” Chiesa said. In North America, most microgrids are in California, where there are high retail rates, and along the East Coast, where state programs for resiliency in the wake of storms have prompted development. Shedd Aquarium’s microgrid includes a 265-kilowatt solar system on its roof and a 1 megawatt battery storage system. The aquarium has set a goal to reduce its energy consumption by 50 percent by the year 2020. It’s not just about keeping the lights on and the penguins comfortable, Gravitt notes. As a nonprofit aquarium that depends on visitors to help pay for operations, it’s also about keeping revenue flowing. A salesman with Schneider Electric says the benefits of microgrids are getting easier to see for certain customers. The electrical grid is looking more and more like a supercomputer. Just as Internet-enabled technology has transformed cars, phones and other everyday devices, big data and code are only beginning to reshape the megastructure that keeps the lights on. Wind provides a key source of reliable energy and helps stabilize the grid, contrary to fears about what happens when the “wind doesn’t blow,” a new AWEA report says.